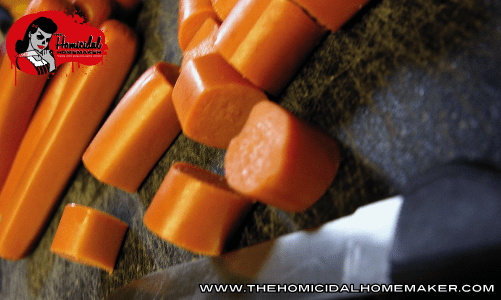 Learn how to make these easy Edible Entrails out of two inexpensive store-bought ingredients, with a little creativity added on top. 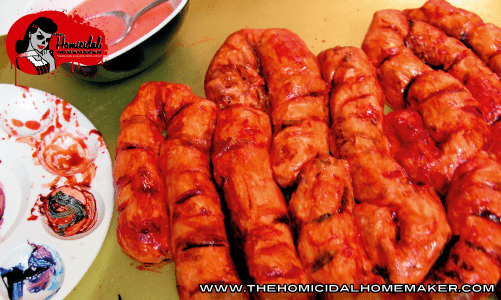 Learn how to make these Edible Entrails – a morbid twist on a mid-century classic! While watching season 2 of The Walking Dead on AMC every Sunday night, I braaainstormed the idea for this dish that could be served as a party appetizer or a meal for two. 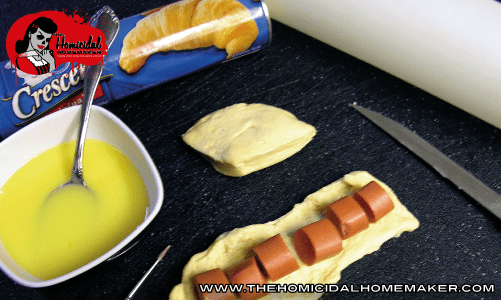 Think of this as a morbid twist on the mid-century classic appetizer “Pigs in a Blanket”! 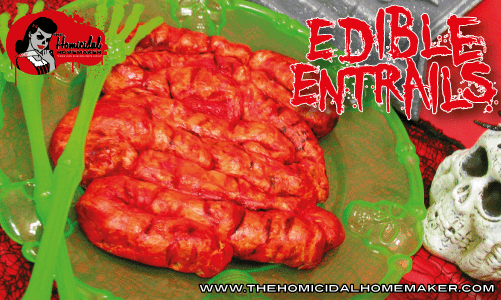 I posted a picture of these Edible Entrails on my personal Facebook, and not a single person correctly guessed what’s tucked inside this 100% edible dish that looks strikingly realistic to the entrails of…something…or someone…that was once alive. My favorite guesses that were posted were chorizo, sausage and ‘something my pet Labrador left in the yard’, which I hope was a joke! This dish is like one giant ‘pig in a blanket’! 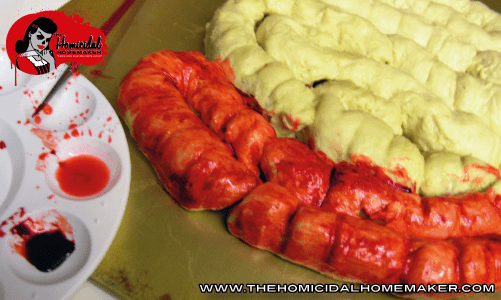 Yes, store-bought crescent dough or puff pastry and hotdogs can be turned into this gruesome-looking dish, with a little bit of time and creativity! The egg wash combined with food coloring gives a glossy finish to the baked dish, really enhancing the gross-out factor of the dish! 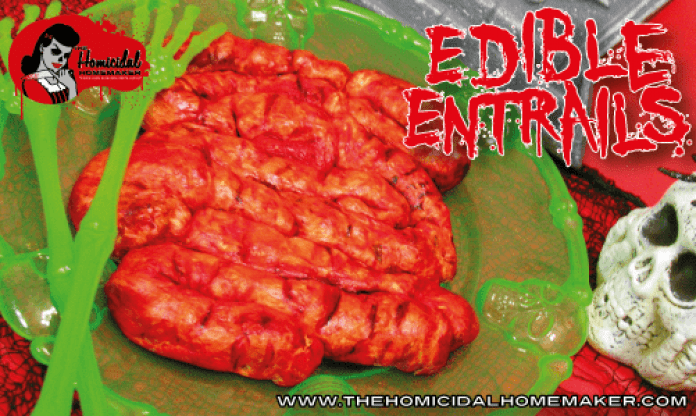 Since originally publishing this, I have made some new variations to the original Edible Entrails recipe, including a sweet/dessert version (cherry-cheesecake, chocolate peanut butter, Nutella & banana), pepperoni-pizza version, sloppy joe version, and buffalo chicken version! Look for them in The Homicidal Homemaker cookbook and on my horror cooking show! Get the 2016 updated version of this recipe on episode one of my horror cooking show! Cut the remaining length of the hotdog into bite-sized pieces. It doesn’t really matter if they’re even; you’re simply cutting them into tiny pieces so it’s easy to manipulate the ‘entrails’ into the desired shape. Make your egg wash. Simply crack an egg into a small dish, add 1 Tablespoon of water, and whisk together until full mixed. For the vegan variation, substitute this with melted vegan butter, or almond milk. Aquafaba (the liquid from garbanzo beans) also works fantastically for an egg wash.
Open your crescent dough, and knead into a solid ball. You don’t want any traces of the perforated lines that the dough comes with. 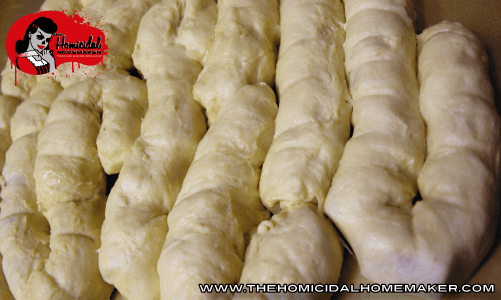 Pull off chunks of dough, roll flat with a rolling pin, and use your hands to manipulate the dough into a long length. Make sure it’s wide enough to fully wrap around a hotdog. To be quite honest, this step wasn’t very easy, as the dough didn’t want to keep it’s shape. However…this totally works in our favor, giving us tiny imperfections which really adds to the final look of the dish. So no worries if you aren’t working with perfectly flat and shaped rectangles. Lay out the bite-sized pieces of the hotdog onto your dough pieces. Brush one edge with egg wash, and fold and tuck under. Set aside, seam side down. Once you have used all of your dough and hotdog pieces, take your greased baking sheet and carefully arrange the ‘entrails’ end to end, and manipulate them into your desired shape. Brush the ends with more egg wash and press together. Also brush egg wash in between the pieces, where they touch, and gently press together. Use a knife or toothpick to add further indentations and detail to the entrails. Then, add a small bit of food coloring to the paint palette. Add a small amount of egg wash to each color, to make a ‘paint’. Using your paintbrush, begin adding color to the dough. I started off with pink, added red to the crevices and indentations, and then went over it all with blue and purple in places. Pop your Edible Entrails in the oven! I left mine in the oven for about 15 minutes and they came out perfect. If they appear to be browning too quickly, cover them with foil for the last 5 minutes of baking. Let the Edible Entrails cool slightly, and then use a large spatula to gently lift them off of the baking sheet. My Edible Entrails were quite large, so I simply loosened them from the baking sheet, and then use the spatula to slide them onto my serving dish. Enjoy your Edible Entrails as-is, or with mustard! Yum!!! For the cherry-cheesecake version, use cherry pie filling and sweetened cream cheese. For the peanut butter cup version, use chocolate chips, peanut butter, and chopped Reese's Peanut Butter Cups. For the Nutella & banana version, use Nutella spread and chopped bananas. I just wanna give you a huge thumbs up for the great recipes and tutorials you have here on your site. I will be coming back often! Love! Been keeping tabs on Facebook. Can’t wait to see your new and inventive masochistic mastication.